Escorial is a rare and luxurious wool from a small sheep originating from the Spanish Royal flocks of El Escorial, today only to be found in small numbers in Australia and New Zealand. The story of Escorial wool is one of remarkable rediscovery. Once a fibre prized by the 15th Century Spanish Royalty, Escorial's heritage, authenticity and rarity combine to make it the pinnacle of luxury today. The Escorial difference is in the heart of the fibre, performing as a naturally coiled spring. This flexible characteristic creates a fabric that is incomparable in drape and resilience with a distinctive soft handle. The suppleness and fluidity of the Escorial fabric delivers a garment of comfort and performance. The Escorial fibre is like a curled spring and when stretched throughout production processes its natural memory is to return to the original curled state. It is this characteristic that makes Escorial garments, lightweight and resilient. Escorial is often likened to curly hair. In comparison to straight hair, curly hair traps air between each strand, providing greater bounce and insulation. The special touch of Escorial comes from the airy nature of the fibre. Jacketings and coatings showcase the Escorial distinction. The loft, bounce and touch of the fibre shows in more openly constructed fabrics - providing the wearer with a soft, light and comfortable garment. Escorial suiting is renowned for its extreme comfort and performance. The key is the 200-year-old natural finish applied to the Escorial suiting fabrics by an English Finishing Company. The Escorial spring makes ultra-light knitwear with amazing elasticity and performance. The natural curly fibre makes chunky knitwear that may appear bulky but is lightweight and extremely warm. 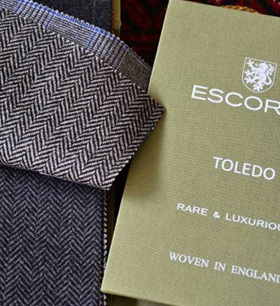 The Escorial among all other woolen fabrics is like a purebred Arabian horse among all other horses. Escorial equals top quality and guaranteed origin. Its properties make it perfect for suits, coats and shawls. The high price is justified both by its quality and limited availability. The sheep from which this wool is obtained are bred in New Zealand and Australia, while weavers' workshops producing Escorial fabrics are found only in Scotland, England and Italy.